The British Gazette » There is no such thing as a free shopping bag! Following the introduction of a 1/- (5 pence) charge for plastic bags, long lasting, fibre made bags are to be seen frequently in the hands of shoppers. Many such bags are covered with promotional material either for a commercial enterprise, a charity or a political cause. These are generally handed out at no cost, the idea being that the shopper gets a free long lasting carrier bag and the enterprise/charity/cause gets some publicity. Thus the bag is not exactly free because in return for not having to shell out £/s/d to purchase said bag, one has to be identified by the general public as endorsing/promoting the enterprise/charity/cause. 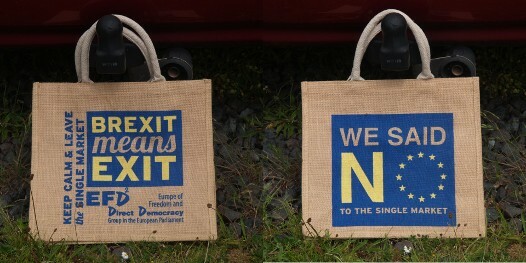 It is therefore with some trepidation I might use the bag in the image above after Friday 29th March 2019! But there again, come April Fool’s Day there MIGHT be nothing to worry about – in terms of economic and political chaos! One person who most certainly DOES think there will be an awful lot to worry about on April Fool’s Day 2019 is Doctor Richard North. In his latest contribution to informed opinion, his blogpost today comments upon the performance on “The Andrew Marr Show” yesterday of that character from the pages of a PG Woodhouse novel, the Honourable Jacob Rees-Mogg. PG Woodhouse was an author of fiction. Given his views on Brexit, so too is the Honourable Jacob Rees-Mogg. In fact were we forced to allocate a particular genre for the Honourable Jacob Rees-Mogg’s work it would have to be in the category of political fantasy. That the Honourable Jacob Rees-Mogg’s efforts are taken as valid and realistic contributions to the political discourse is something that deeply worries Doctor North and many other people! Throughout the period since Midsummer’s Day 2016, question that has perplexed the minds of Dr. North and others has been the question, “Is she? Isn’t she? Mad.” “She” being Madame Mayhem of course. Much of the despair to be seen in the comments section of Doctor North’s blog relates to the reasonable assumption that the EU27 will regret a “hard Brexit” but will feel constrained to do little by way of actively trying to prevent it. What is undoubtedly the case is that whilst a hard Brexit would be catastrophic for the UK it would also be deeply damaging to the EU27 – with some, most notably the Irish republic – being very badly damaged. There is no doubt that the prospect of a hard Brexit is like the prospect of being hanged, concentrating the mind of Ireland’s Taoiseach, Leo Varadkar TD wonderfully. Thus it is not an outlandish supposition to suggest that the EU27 might be thinking of some means of stopping such a disaster. The means of which was outlined in our article of the 25th (http://www.british-gazette.co.uk/2018/05/25/theresa-may-can-she-be-that-stupid/). The answer to that question can be summed up in one or two words: “Ireland” and “Ireland’s economy”. So, to return to the question of whether or not Madame Mayhem is a fool, we would venture to suggest she might be a gambler. Madame may be placing an accumulator bet on the actions of the EU and then the House of Commons. Now of course, all British Gazette readers will be aware of the pitfalls of the accumulator bet! Whilst such bets can produce vast sums, they are high risk and are more likely to result in nothing! Thus there are many who would state that Madame is both a fool and a gambler! Let us now examine in detail what are the gambles that Madame could be making. The first is that the EU27 will make the offer to “stop the clock”. You see, IF Madame manages to achieve these two things, she can then go to the electorate saying that she tried to deliver what the British People voted for on the 23rd June 2016, but the Labour Party, the SNP and the Liberal Democrats frustrated this! You see, Madame’s mind will be focused upon Thursday 5th May 2022 more than on Friday 29th May 2019 or 31st December 2020 for that matter. Because that is the date by which the next general election must be held! You see, 1,133 days or 3 years, 1 month and 6 days will have passed between what at the moment is Brexit Day (Friday 29th May 2019) and election day 2022! As it was famously said, “a week is a long time in [British] politics.” Therefore, 3 years, 1 month and 6 days is an eternity! As to what the positions of the main political parties (Conservatives and Labour) will be on the issue of Brexit, that is anybody’s guess! You see, Dear Old Comrade Corbyn will be 21 days from his 73rd birthday and there will be many in the Labour Party who will suggest that that is too old to be Prime Minister.